Tough day today (and not many photos). This is where the road building frenzy in the area actually became dangerous. Just 30 minutes out of Kalopani, we hit a couple of snafus. Our guide book, map and Maps.Me agreed that we should follow the marked NATT trail described by Mr. de Ruiter in "Trekking the Annapurna Circuit" as "a marvelous jungle walk on a soft forest trail. You will love it." Unfortunately, the marvelous trail had been literally ripped out in several places. First we had to slide down an almost vertical slope to the new dirt road. Minutes later, we faced a 50 foot vertical wall of sand, loose dirt and gravel that had been scraped by a crane from the mountain side maybe a day earlier. We could see the trail above, but there was no way to get there except a nasty upward scramble. One step up, three slides down... We eventually (miraculously) made it to the top, covered in dirt. All that effort for a mile walk in the woods. It was soft and lovely, but short. Before we knew it, we were descending back down to the road into Ghasa. We checked in at the ACAP checkpoint, showing our permit and chatting a bit with the ACAP officer. He never once mentioned the danger ahead. Walking out of Ghasa, we followed the trail signs through a grassy field down towards the river. Suddenly, the path was completely blocked by giant boulders. That's when we heard the cranes working on the road high above. We saw the crane scoop a large shovel of rocks, sand, and dirt from the mountain side, turn, and toss it down the hill, creating a landslide of debris landing on the NATT trail. Caffrey picked his way across the rubble after the crane turned. He made it to the other side just as another shovelful was unloaded. Huge boulders bounced hither and thither, finally smacking into the others just a few feet from where I stood. I screamed. Loudly. It was an unplanned gut reaction, but it worked. The guys above saw me waving my arms. I heard shouts as the crane was turning to dump another bucket. I crouched behind a big boulder. The crane stopped, the shovel poised above the hill. I peeked out from behind my rock and saw the construction crew waving for me to cross. I scrambled across the rubble and met Caffrey on the other side. Out of the danger zone, we heard another landslide. 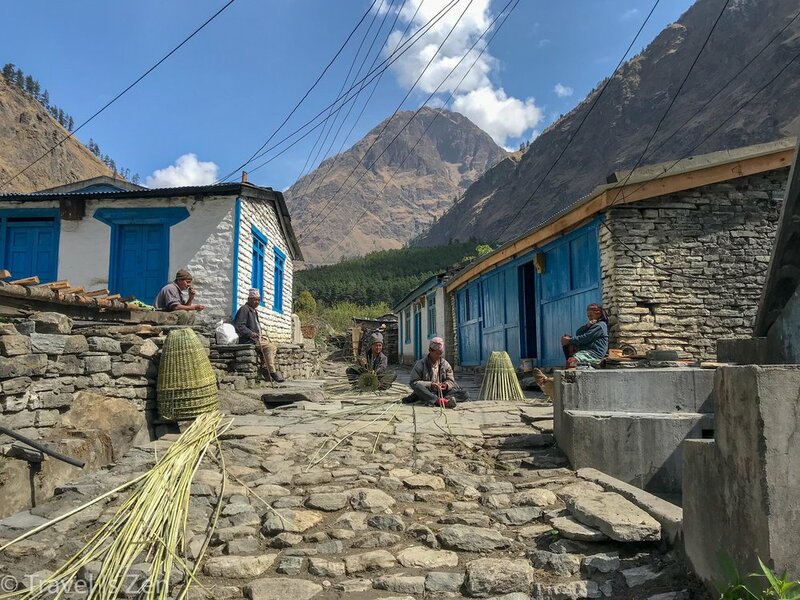 There was no safety crew stationed along the trail out of Ghasa to warn trekkers about the construction; no actions taken by the crew above to watch for or warn anyone below. It is not an exaggeration to say we could have been killed by carelessly tossed, stampeding boulders. As we crossed a rickety, old wooden suspension bridge (the safe modern steel bridge was blocked), I was still shaking. Back on the safe East side of the river, we ate a Snickers bar by a soothing waterfall to calm our (my) nerves. Then we followed the well-marked NATT trail down, down, down for many miles. It was a sunny, warm day and I eventually relaxed from the morning's excitement. We passed freshly plowed fields, breathing in the smell of wet dirt and the promise of Spring sprouts. The trill of the Himalayan tree frog filled the air. For hours, we continued to follow the downhill rush of the Kali Gandaki as it mades it way to quench the thirst of a billion people along the Ganges. Pine trees gave way to banana trees and other tropical flora; bees busily gathered nectar from vividly colored flowers. As we neared Tatopani, we had to improvise once again when the suggested path was blocked by a barbed wire fence. We followed a dusty dirt road for about a mile and then crossed over the river via a suspension bridge. On the western side of the river, we climbed a well-worn-but-suspect trail up another crane-made landslide slope to the road where another crew was hard at work. We wound our way through mud, wire retaining wall baskets, rock piles, and a back-up of buses, taxis, and scooters. The road terminated in Tatopani. What a day. 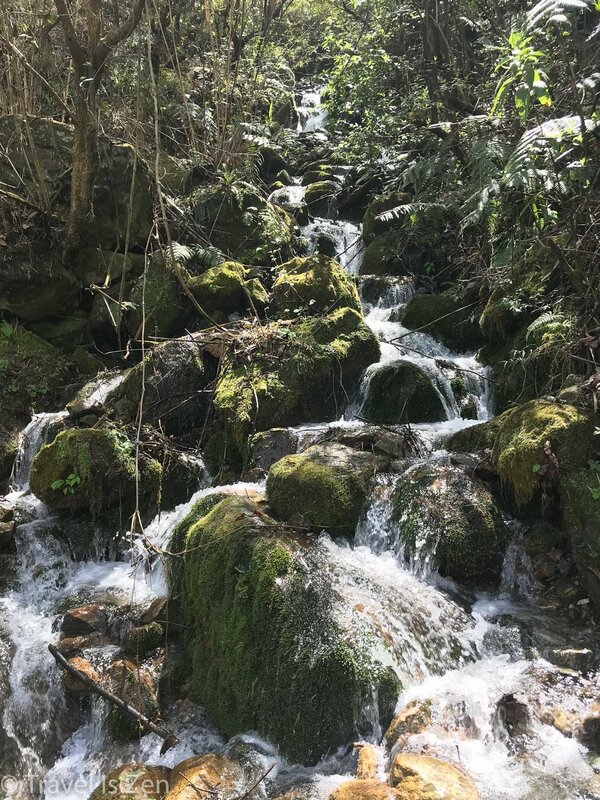 Despite the lack of photos, the trail on the eastern side of the river was serene and pretty - paths between rock-walled gardens, goats and cattle chomping on greens, an enormous waterfall and well-maintained trails. All the road construction on the west side between Kalopani/Lete and Tatopani is new and not documented in trail guides and maps (as of Spring 2018). We saw professional guide-led parties encounter the same obstacles. Proceed with caution and stick to the east side of the river as much as possible.